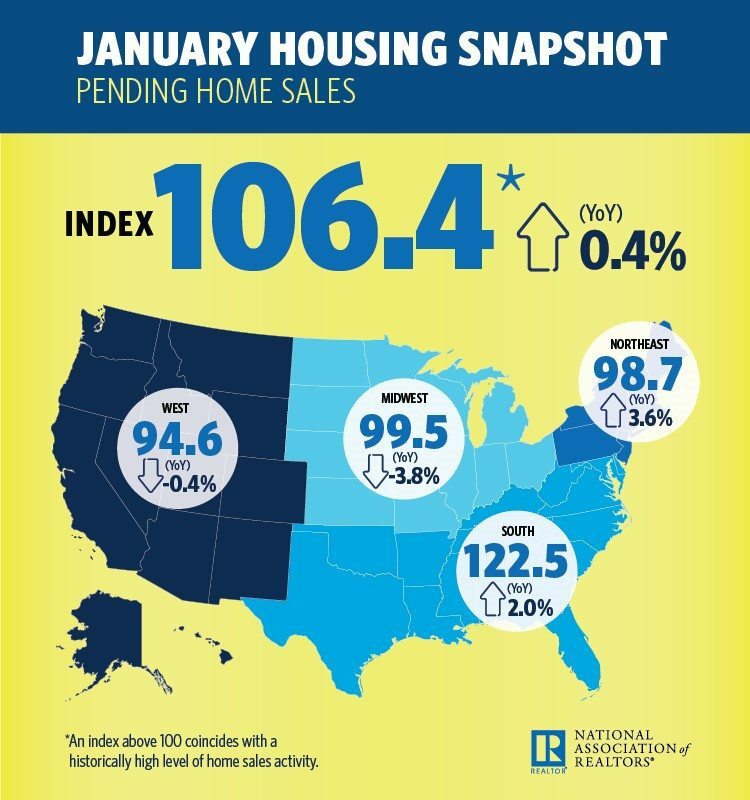 In January, NAR's Pending Home Sales Index declined 2.8 percent to 106.4 down from an upwardly revised 109.5 in December. This month, the PHSI is 0.4 percent above January 2015 -- but it's still the lowest index since then. The real estate roller coaster continues as the National Association of Realtors‘ (NAR) Pending Home Sales Index (PHSI) slides to its lowest level in a year. “The significant shortage of listings last month along with deteriorating affordability as the result of higher home prices and mortgage rates kept many would-be buyers at bay,” said NAR Chief Economist Lawrence Yun in a statement. January’s PHSI decreased 2.8 percent to 106.4, and despite being 0.4 percent higher than January 2015, is the lowest index seen in a year. Last month’s numbers are also down from an upwardly revised 109.5 PHSI for December. The PHSI in the Northeast rose to 98.7 and is 3.6 above a year ago. In the Midwest, the index declined to 99.5, and is now 3.8 percent lower than January 2015. Pending home sales in the South rose to an index of 122.5 — a 0.4 percent month-over-month and 2.0 percent year-over-year increase. The West experienced the biggest loss with an index of 94.6 — a 9.8 percent month-over-month and 0.4 percent year-over-year decrease. Yun says the health of the 2017 housing market will continue to be dependent on borrowing costs, consistent job growth, affordable home prices and more inventory. “January’s accelerated price appreciation is concerning because it’s over double the pace of income growth and mortgage rates are up considerably from six months ago,” said Yun.